The drought is finally over. The Boston Celtics have finally made it over the most frustrating hump of this season and beat the Toronto Raptors to take a 1.5 game lead in the standings, making Brad Stevens the clear favorite to be Boston’s second All Star this season. The Celtics also did it on a night when, for three quarters, they played one of their worst games of the season. Neither team was at full strength, just like it has been all season long, so we still have not had the best possible test between the two. That being said, after going down by as much as 17 points, the Celtics had absolutely no business winning what looked like an utter embarrassment in front of their home crowd. 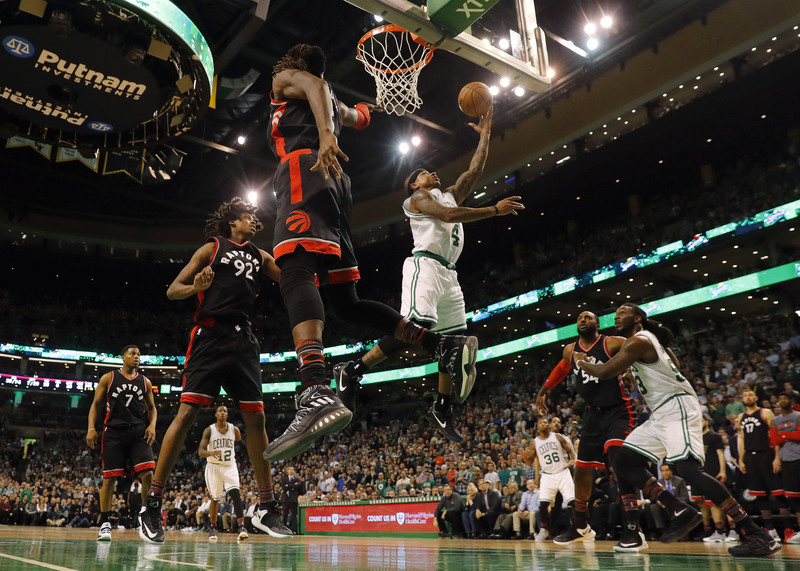 The Celtics were letting the Raptors do whatever they want, who opened up hitting 20 of their first 25 two point shots. Their offense was missing layups and were struggling just to dribble for much of the game. 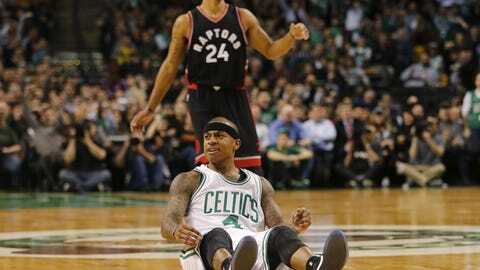 The Raptors held onto that double digit lead for long enough that the Celtics looked like they were without hope. Except for one thing, “the little guy”. Starting with seven points on two possessions to close the first quarter, Isaiah Thomas continually forced his way to the free throw line, and did enough to keep the game from blowing up. The Celtics did a good job of turning the 17 point third quarter deficit down to single digits, setting Thomas up to do what he has been doing better than anyone in the NBA, score in the clutch. For the second straight game Thomas put up over 40 points and over 15 in the fourth quarter. Whether it was four clutch free throws or a chuck after a foul, Thomas would not and could not miss. 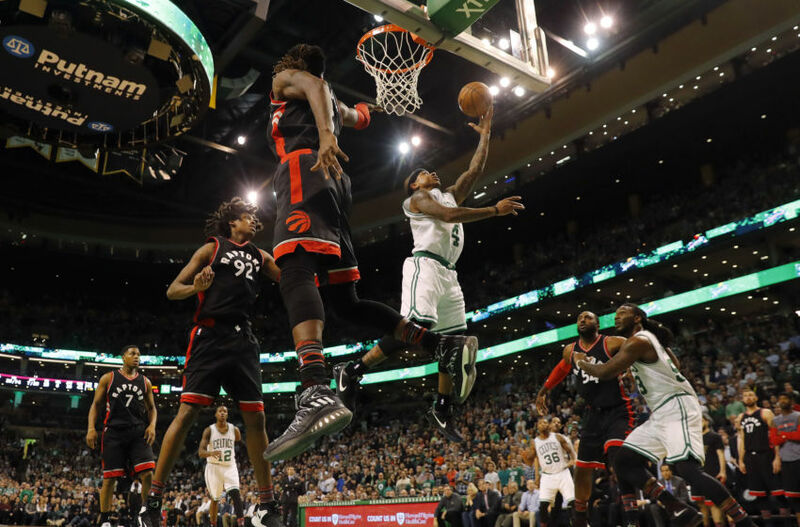 Marcus Smart also brought the energy they needed in the fourth, coming up with clutch defense on Kyle Lowry and maybe the rebound of the year for a team that has been hopeless on the boards all season long. With the Celtics constantly having to make up for his defense, Thomas has had some rough net rating numbers this season. Against the Raptors, Thomas made it clear that he can do a lot more than just make up for his defense. The Celtics were lost without him and with four starters ending the game with a negative +/-, Thomas made up for all of it for a staggering +17 in a game decided by just five points. As Thomas continues to climb up the scoring ranks there have been some whispers about him being in an MVP conversation. The unfortunate reality is that one player is averaging a 30 point triple double, while another player has a shot to lead the league in points and assists out West. So, for now, we can say that this performance gives Thomas as good of a case as Eastern Conference MVP as anybody. The remarkable scoring is not enough, however, to make that a deserving statement about Thomas. What makes it easy to see, is the truly unprecedented fourth quarter and clutch scoring he puts on display each and every night. The Celtics lead the league in close games and they also lead the league in clutch wins with a 14-6 record in games decide by five points or less. Time and time again, Thomas has been bailing out whatever problems the team is having, because he is scoring in every and any way that he wants to. It is uncanny how many wins this season have come down to Thomas scoring in the clutch, and on a night when the Celtics would have lost by more than 20 without him, he put this team on his back in a way that he usually does not have to. Thomas has firmly put himself right around the top three in the MVP standings right now, but the only chance he has is catching the Cavaliers, who finally looked like themselves against the Timberwolves. The Celtics are back on a hot streak, and they have been doing it playing sub par basketball as a team. Thomas has been the most exciting player in the league this season, and it is an absolute treat that fans get to see him perform in these kinds of games night in and night out. Thomas started by saying he wanted to be the greatest little man to ever play this game, and he is standing right behind Iverson in that category. Then he said that he believed he was the best player in the league and he starts doing things no one has ever seen before in the NBA. For all his faults, and there are a lot of them on the defensive end, Thomas is doing everything and anything that this team needs to win these games. It would almost be unrealistic to expect Thomas to keep up this pace, and continue to play this well in the fourth quarter. That being said, Thomas has been doubted many times in his career, and that has only turned out one way for him. When playing like this, Thomas is the superstar that the Celtics have been searching for, but it would be nice if they could put together a few games where they consistently play well as a team.